Discussing consciousness is entering a dangerous swamp with lots of traps, dead ends and scary monsters. Scientists can’t even agree on a definition. The whole shebang can also get very mystical. So let’s lighten up. We’ll start with a few things we can agree on, even though the first topic, emergence, itself can be a bit of a puzzle. “Mind” will get some in apoplectic rage. But we’ll finish off with a whiff of basic Buddhism, peacefully. If we stick chemicals together, a whole new property can appear. This is the idea called ‘emergence’: the whole is more than the sum of its parts. Take carbon, hydrogen, oxygen and nitrogen. A couple of carbon atoms with some hydrogen and oxygen has the wonderful effect of inebriation (alcohol). Hydrogen carbon and nitrogen make a deadly poison (prussic acid). Nitrogen and oxygen make an anaesthetic (laughing gas). And so on, for billions of substance made from our hundred or so elements. More complex bits can also organise themselves to create new qualities. Embryo cells self-organise to create an arm a toe or a kidney, with no one to tell them how. Ants run their own ant hill – as one researcher puts it “they think locally and act locally, but their collective actions produce global behaviour”. Birds and fish wheel about in gorgeous patterns simply by following a few simple rules. There is no “hive mind” controlling them. Now sometimes the properties of the final thing are easily predictable. Sometimes they aren’t. Life, for instance, is one of the least predictable outcomes of basic chemicals getting it all together. But what about consciousness? After all, as the philosopher Colin McGinn so starkly puts it, you can’t turn “meat into consciousness”. We’ll get back to this in a bit, I promise, but through a round about route that takes in responsiveness. Animals aren’t industrial robots, condemned for ever to repeat the same simple actions over and over again: they can respond flexibly to the problems of their environment. After all, not every dog chases every cat that passes, especially if there is a juicy bone to chew on or it’s time for walkies or just too damn hot. The simplest creatures can show quite complex behaviours. Amoebas get smartly away from acids; slime moulds can solve a simple maze; spiders can solve 3D mazes. As we saw in the news recently, bees can learn to play football just by watching. OK they aren’t Man U, but give them a break. However, these little devils don’t need any kind of “animal mind”. That comes later. As animals get more complex, with bigger brains, they need to pull together their memories and problem solving routines and all their senses and ways of working efficiently with each other to track their prey and do other impressive stuff. It’s a shame there isn’t another word for this, but we need to give this organising thing a name. At the risk of alienating some readers, we’ll settle on “animal minds”. Not super-duper human minds. Absolutely not! No: a pale, thin, stripped back, basic version, suitable for gorgeous, smelly beasts, mucking about in the dirt, where we won’t even try to apply such a term as “thinking”. But what can they actually do? We learn. Animals learn. That seems pretty obvious – they aren’t for ever restricted to the same old tricks. But they can do so much more. From cunning experiments, looking at mirrors and video displays, apes can show a sense of self. In a series of fascinating experiments, monkeys know what you know, when it comes to guessing which humans know where the food is hidden. Many animals deliberately deceive potential watchers when they go about hiding their own stash. Gorillas can use hundreds of signs to communicate very effectively with humans. And birds even demonstrate word order – what was thought to be a unique human trait (their “words” are snatches of song; and yes, I know, they aren’t hairy). Dolphins are brilliant at displaying an understanding of the concept “new” and will happily perform totally original flips to please their keepers (OK OK, calm down, I don’t support dolphinariums either). Chimps and birds can even do some basic maths. And crows are really clever (see http://bit.ly/clevercrows). Mice can show a primitive form of empathy and monkeys will starve themselves to avoid inflicting pain on others (I will spare you the details – luckily, modern animal experiments don’t involve pain). 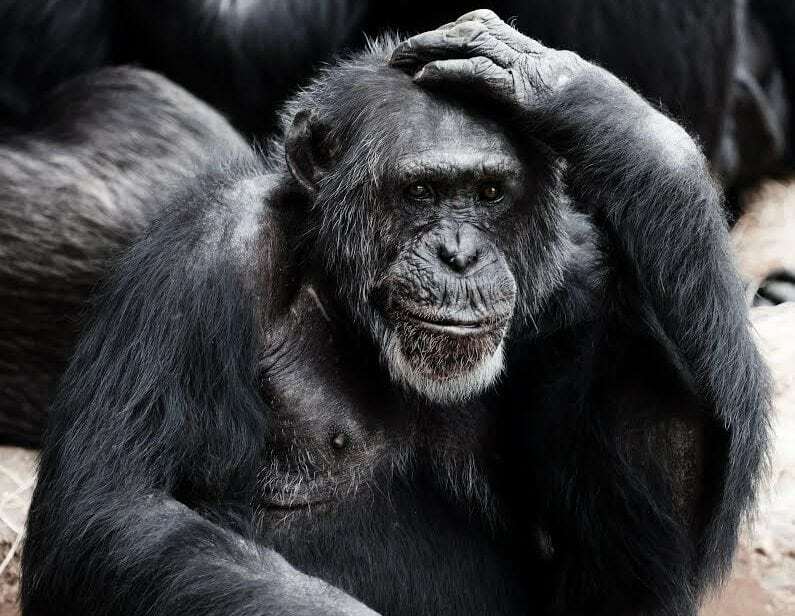 A cheeky video shows monkeys with a basic sense of fair play http://bit.ly/monkeyjustice and chimps living in groups have complex social rules. But what’s all this got to do with human consciousness? Now, you can’t just take isolated intelligent chunks of brain from different animals, glue them all together and make a human brain. But what the research suggests is that the attributes we so admire in the human mind, have their roots in the grubby world of our wild, distant cousins. And once turbo-charged with that most powerful factor, human language, we waken up into full human consciousness: animal minds plus words. That most curious property of all – subjective experience – is a characteristic that emerges when the brain reaches an appropriate level of complexity. The brain is, after all, the most complex structure on the planet, with more potential connections than there are atoms in the whole universe. And, unlike a computer, as we learn, this almost infinite set of links changes in shape and number. Even computers (which are boringly predictable), particularly when arranged in networks, can learn together to solve problems. And, most importantly, they can come up with unpredictable results. Strategies we hadn’t given them, can emerge from electrical circuits – like poker playing bots learning to bluff, all by themselves http://bit.ly/robotsbluff If bits of metal can do weird emergent stuff, why shouldn’t we? Thus, emergence in the brain, leading to mystical looking (but totally natural) properties such as subjective-experience-giving is not such a shock. Answering McGinn, we agree, in general, ordinary lumps of meat can’t create consciousness. But zillions of neurons all interacting with each other, can. So, we’ve got one story about consciousness and subjectivity, with more holes than Charlie Chaplin’s socks. Enlightened researchers will come up with a better one and one day we may even get the full monty answer (the brilliant Sir Roger Penrose may get there in his new whizzy-bizzy institute, but even he can’t explain how the “microtubules” he bangs on about in brain cells, give rise to that strange feeling of subjectivity – he probably still needs emergence). And the world will be astounded for a while. Then we’ll go back to our ordinary lives and daily miseries, because happiness arises not from things or people or bright ideas, but from inner peace. Dr Nigel Mellor who tweets on @nigelmellor123 is author of Buddhism#now: Big Questions. Inner Peace. LOL. bit.ly/buddhismbook which tackles the big issues of life, the universe and consciousness, with simple words. And a bit of humour. You’re not as daft as you look!